Vacuum pumps and systems are used in applications that require reliable hold down force of various products and substrates during additional processes. Choosing the right type of vacuum pump for your process is a very important decision that requires several considerations. Systematic Automation understands the technology behind the force of vacuum tables and will guide you in choosing the right type of vacuum pump and table for your application. Some people may think that a vacuum pump with increased horsepower is better, regardless of the application. This is not always the case. Increased horsepower does not necessarily yield an improved process, although it will definitely increase your electric bill. The answer to how much vacuum force you need is dependent upon these several factors. The surface area of your item is of important consideration when evaluating vacuum pumps and systems. Small or odd shaped parts will require more vacuum force than large substrates such as sheets of metal or aluminum. It is important to consider the friction between the vacuum table and the substrate when choosing the right vacuum pump and system. Slippery surfaces may allow the item to move even with high vacuum force. Vacuum tables with a non-slippery surface will hold your substrate firmly in place when the proper vacuum force is applied. The air permeability of your part or substrate is a very important consideration which has a significant effect on the amount of vacuum force required. 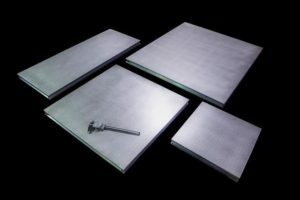 Items with greater air permeability such as paper products or canvases will require more vacuum force than a solid sheet of aluminum, wood or metal. The type of process or application is an important consideration when determining the right vacuum pump and system. A critical computer numerically controlled (CNC) process requires reliability and accuracy, as computer programs are driving the cutting or machining process. The vacuum table must be just as reliable which means it needs to be consistently flat with the right amount of force to support critical processes such as with a CNC router or cutter. Systematic Automation offers superior vacuum table systems and vacuum pumps for these and many other applications. Systematic Automation has been manufacturing superior vacuum pumps and vacuum tables for more than 35 years. We are recognized as industry leaders, setting the standard with +/-.001” per linear foot on all our tables, no matter the size. We offer vacuum tables in virtually any size from 5” x 6” up to 72” x 144”, no job is too large or small for our engineers. We offer custom designed tables when you require configurations outside the box. We provide vacuum systems with a host of options to enhance virtually any process, including CNC router vacuum tables for critical processes. Our experienced design engineers understand the technology behind the system, delivering exactly the vacuum force your application demands, without paying for additional specifications you don’t need. Systematic Automation offers quality built Regenerative vacuum pumps, which allow some leakage while providing maximum hold down force. The Rotary Vane vacuum pump provides stronger hold down force required in a smaller number of applications. Whatever your application, Systematic Automation has the right vacuum pumps and systems for you. Systematic Automation is an industry leader in manufacturing automated equipment such as superior vacuum tables, screen printing machines, flame treatment machines and UV curing systems. All machines are manufactured in our modern facility in the U.S. with quality components. Systematic Automation offers industry expertise from experienced engineers who understand the vacuum force required for virtually any application. We test all equipment for high quality performance prior to shipping and provide ongoing customer service. Contact us today to learn more about the many options available with our vacuum pumps and systems.